Joni Mitchell sang a very popular song about love: “From both sides now”. The lyrics “ I’ve looked at love from both sides now”, might just as well be translated into “I’ve looked at races from both sides now” for the purpose of this article. As athletes, we sometimes forget about the hard work that goes into the organising of a race. We take for granted the fact that everything; from the entries, toilets, water points and traffic marshals, will be in place. We bargain on the fact that there will be a well-stocked water point every 3 km, and that there will be in fact water, cold drinks etc. What we often forget, (and by “we” I count myself as well! ), is that the helpers at a water point are volunteers, who have no control over how much water there are, how cold the water is, etc. They are there to serve, and make the race more pleasurable for the athletes. A: Get up at 4h30, get ready, drive to race, do all the necessary things to line up for a 6h00 start. WPH: Get up at 3h30, get ready to be at water point at around 4h00. Put up tables, stack cups, pour cold drink into said cups; break big blocks of ice into plastic containers; cut open countless boxes of water sachets and throw them into the container. Ensure that all helpers know what to do, where to stand (out of athletes’ way!) etc. WPH: Depending on which point in the race your water point is, get ready to serve. Might take up to 40 minutes of waiting. A: Get to table, grab some water sachets (or 2 or 4, or on some cases 8! ), maybe drink some Coke. Thank or don’t thank the WPH. May complain about water not being cold enough. Drop sachets in bin, next to bin, or in the vicinity of the water table. Carry on with race. WPH: For the next 30-40 minutes, some or all of this happens: stand and hand out sachets. Pour cold drinks. Hand out sachets. Again. Explain why all the sachets aren’t icy cold. Pour some more cold drinks. Try to keep the plastic container with the water sachets cold with extra ice, which you buy from the nearby garage. Use the rake to gather the discarded sachets together. Start picking up rubbish. If it is a double lap race (10/21 km, or 21/42 km), get ready to do it all over again in the next hour. A: See point 3. May complain louder about the lack of water, or the coldness thereof. Discard sachets anywhere near the water point. Or not even near. Carry on with race. WPH: See point 3. Give up trying to rake the sachets out of the way of the athletes. There are too many (sachets, and sometimes athletes..). Try to explain that it is not your fault that there is no water left, or that the water that is left, is not cold. A: Finish the race. Collect medal. Rest. Go to club gazebo and complain loudly about the lack of water at some races, and the fact that you almost fell while slipping on “so many!” water sachets that are just lying on the ground at the water point. Go home. WPH: After the last athlete has passed the water point, start to pack up, clean up, pick up, rake etc. Ensure that the area around the water point is completely clean. Chase a few stray water sachets that the wind blew into drains and neighboring gardens. Fold up the tables and pack away. Go home. Although I may have over-dramatised some of the negative things happening, I must also say that most of the athletes that go through a water point are friendly, say “thank you”, and try to throw their sachets in the bin. 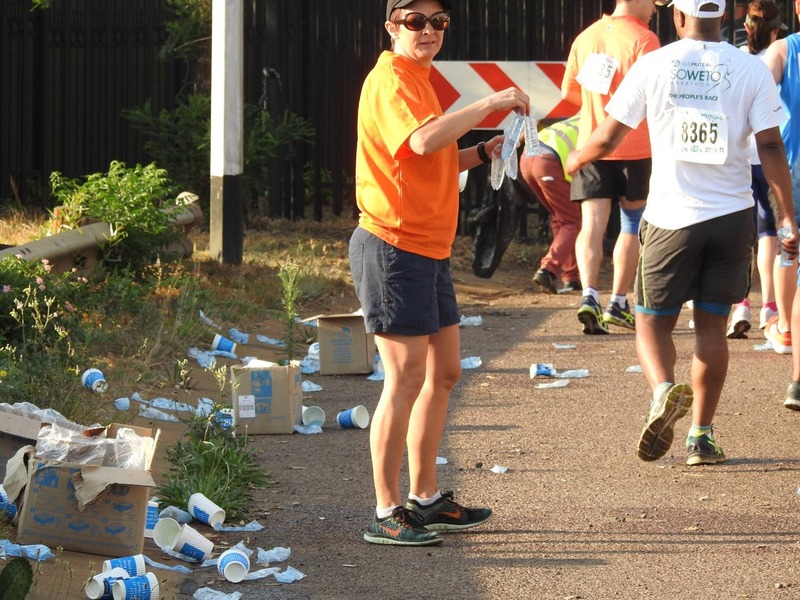 When running a race, I make a point of thanking the helpers, and try to throw my waste in one of the bins. I wish every athlete gets a chance to serve at a water point. It is very rewarding to help, and also a great way of giving back. Next Next post: A very hot Sunday!